A social media campaign launched to help find a Denbighshire pensioner missing in Crete has been backed by people across the world. Arthur Jones, 73, from Denbigh, has not been seen since 19 June, two days after arriving on the island. His family asked for information online using the slogan: #FindArthur. Since then people in Australia, the US, Thailand and Hong Kong have posted picture messages on social media sites to highlight the search. 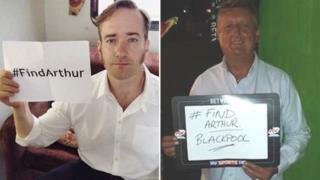 High profile names who have backed the campaign include darts player Eric Bristow and Ripper Street actor Matthew MacFadyen. Mr Jones's son Jeff, 37, said the response from people has been "overwhelming". He added: "We were prepared to try anything to raise awareness and the reaction has been phenomenal. It really does take your breath away that people have got behind it." Mr Jones said this campaign has reached people in areas of the world they could never of dreamed of contacting and helps the bid to find someone who may have had contact with his father. "If he's bumped into someone or met someone and told them his plans, hopefully it will help find that vital witness," said Mr Jones. Early in July, police found Mr Jones's name in a war cemetery visitors' book, at Souda Bay, near the city of Chania where he was staying. Officers identified British tourists who had signed the same book that day, in the hope he may have shared his plans with someone. Mr Jones, a keen walker with 40 years' experience, told relatives he planned to go on a walking trip but had not left any details of where. Anyone with any information about Mr Jones has been asked to contact their local police force on 101.